It is rare, that I travel outside the region to taste champagne… I always felt it made no sense since I live here. 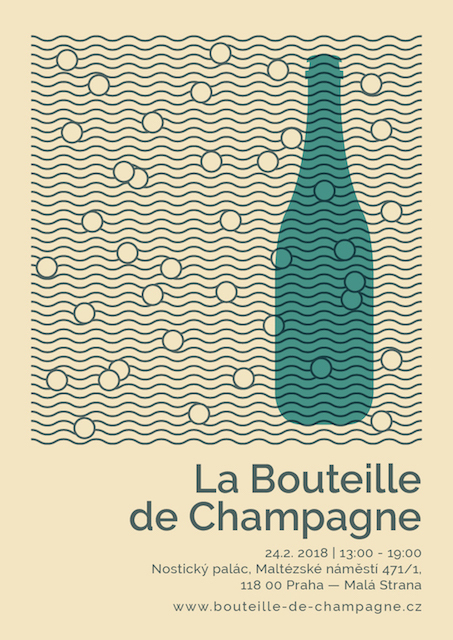 Yet, on Thursday I will board a plane to Prague to attend La Bouteille de Champagne on 24 February. The reason I am going is because it is the first real Terroir Champagne fair organized abroad. For me it encompasses the essence of Terroir Champagne, as the only exhibitors are growers who have eliminated herbicides to produce terroir driven champagne. Moreover, all 13 producers will be present at the fair to share their passion for sustainable winegrowing and explain the specificities of their terroir. The list of producers is EXCITING, in fact it’s surreal to have such a wonderful line-up in a relatively small champagne market. It’s proof of the champagne passion and dedication of Milos Danihelka and Antonín Suchánek, two Czech importers and the organisers of the the fair. Both Milos and Antonin discovered Champagne in 2009; Milos first Champagne experience was a visit to Perrier Jouet with his gourmet school, while Antonin purchased a bottle of Piper Heidsieck while on business in London. Both were immediately bitten by the Champagne bug and returned to holiday in the region, both determined to discover smaller artisanal producers. Realizing these smaller producers hardly featured in the Czech market, Antonin set up Champagnier, an import company, in 2010 and in 2011 he began to import Champagne Fleury. “When I tasted the Fleury wines, they made an amazing impression on me. The champagnes were so unique that I had to introduce them on the Czech market”, reminisces Antonin. In 2014, Antonin joined forces with Bogdan Trojak (winemaker, poet, wine bar owner and founder of Veltlin.cz) to create Prague Drinks Wine, a natural wine fair. From the beginning some champagne producers exhibited at the fair, but the timing at the end of spring was complicated for many growers. Hence the idea grew to organise a dedicated fair in winter, when it’s easier for the Champenois to travel. Milos elaborates: “For a long time we toyed with the idea of creating a special fair focused on Champagne growers in Prague. We are both very big champagne lovers, we both distribute this type of Champagne wines also, that is why this was another natural step. We got further inspiration at Les Printemps du Champagne, which we visited several years in a row. Compared to Prague Drinks Wine, La Bouteille de Champagne is smaller and more focused; there will only be champagne poured for more selected and generally more trade focused audience.” In order to deliver a more cohesive and personal experience, the amount of exhibitors has been limited to 13 for a maximum of 300 visitors. This will allow the visitors to have meaningful interactions with the growers, adding to the artisanal and handcrafted vibe of the fair. The venue, the beautiful, imposising Baroque style Nostic Palace further encompasses this philosophy, with its history of being a social and cultural hub for the lucky few. The stately home was built between 1660-1676 and is located in the centre of Prague, making it easily accessible for all visitors. 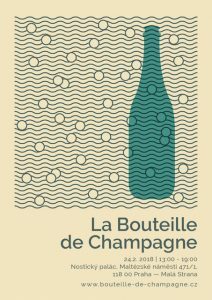 The 13 producers present at La Bouteille de Champagne are: Benoit Fleury (Champagne Fleury), Olivier Collin (Champagne Ulysse-Collin), Benoit and Valerie Lahaye (Champagne Benoit Lahaye), Benoit Déhu (Champagne Benoit Déhu), Vincent Laval (Champagne Georges Laval), Jean-Marc Sélèque (Champagne Jean-Marc Sélèque), François Huré (Champagne Frères Huré), Franck Pascal (Champagne Franck Pascal), Guillaume Doyard (Champagne Doyard), Vincent Charlot (Champagne Vincent Charlot), Marc Augustin (Champagne Marc Augustin), Adrien Dhondt (Champagne Dhondt-Grellet) and Jérôme Prévost (Champagne La Closerie). You can read up on all growers (bar 3) in Terroir Champagne:the luxury of sustainable, organic and biodynamic wines. A few copies are still available here. Just for the record, the second version of the book will include portraits of all 13 growers! The event takes place on Saturday 24 February 2018 from 13-19h at the Nostic Palace, Maltézské náměstí 1/471, 118 00 Praha 1. Tickets are selling out fast, book here to secure your place now.